I’ve been doing a lot of cooking lately, but I’ve pretty much sucked at the documentation part of things. I could tell you about the amazing chicken tortilla soup I made yesterday for lunch or the wonderful spicy pork loin I roasted the other day, but without photos or a story, there ain’t much to tell. It’s not that I’m becoming a bad blogger or anything like that, it’s just that with the holidays around the corner and a trip to visit family across the country looming, time is of the essence. I’m sure I’m not the only one feeling pinched by time! 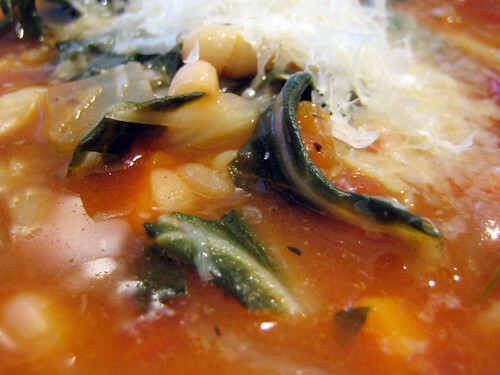 Which is why this recipe for a hearty Italian pasta and chard soup is a perfect no-brainer. It’s quick and simple and any leftovers make a delicious speedy and filling lunch. And top this bowl with some organic parmesan cheese…well, you can almost forget about all the directions you are being pulled in. In a large pot, heat oil over medium heat and add in onions. Saute until soft and then stir in the garlic, red pepper, carrots and sprinkle with 1/2 t of salt. Add in the tomatoes and pasta and the vegetable broth, stirring constantly so the pasta doesn’t stick to the bottom of the pot. Add in chard, beans and the remaining herbs and spices. Lower heat and cover until vegetables are done, about 15-20 minutes. Serve in big bowls topped with freshly grated parmesan. Well I think that soup looks pretty good, and serves as great documentation. It looks comforting and so good, Kickpleat! I’m at home with a bug today and wish someone could make me a bowl of that hearty looking soup…too bad though, it looks like a can of Campbell’s will have to do since I’m in no shape to cook anything. Looks fabulous and so comforting. A hug in a mug. Quick and simple and using leftovers? Hurrah! Sounds like a keeper. it really is soup weather around here with all our snow. Thanks for sharing this one. Man I miss my chard in the winter..
thanks judy, the soup was delicious! thanks patricia, it is perfect comfort food! aww, kitchen goddess, i like that! thanks lynn, it is a keeper. aimée, we don’t have any snow here, but i’m sure this soup could melt all that cold weather! you grow your own chard, kevin? lucky! i just buy mine at the store. i subbed egg noodles for the pasta and kale for chard due to a bare cupboard. with a loaf of leek potato bread from fratelli’s it was the perfect end-of-the-week dinner. thanks! It’s so wet and cold here in Oregon and that soup would so hit the spot. Thanks for the idea…yum! alyssa, sounds perfect! mmmm, fratelli’s! 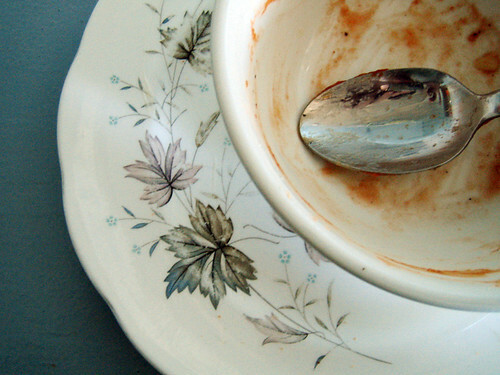 moving on to the pumpkin and black bean soup…. 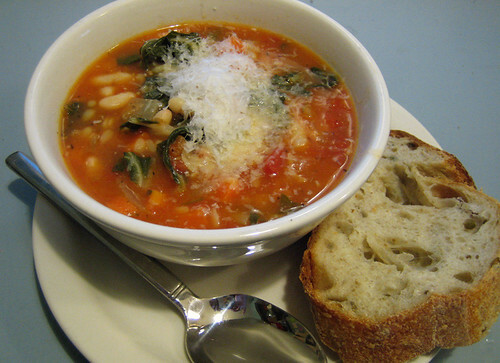 Making this minestrone soup again – delicious and easy to make with leftover bits of veg. 🙂 Lovely with the parmesan too.